Day 1. Arrive at Cape Town International airport. Meet & Greet service with assistance with passport control and customs formalities. Dinner at the hotel and overnight. Day 2. Table Mountain – Robben Island – 1st concert. Afternoon visit Robben Island. The ferries depart from the Nelson Mandela Gateway at 13:00 at the V & A Waterfront. The tour takes 3.5 hours including the ferry trip to and from the Island. You will disembark at Murray’s Bay Harbour situated on the east coast of the Island and take a short walk to buses that will transport you to all the historical sites around the Island. On the way to the buses, you will pass buildings and a high wall built by prisoners during the 1960s.The buildings were used for family and lawyer visits to prisoners. You will meet your Tour Guide when you have boarded the busses. The Tour guides inside the prison are former political prisoners. They are fully conversant and knowledgeable about the Island’s multi-layered 500 year old history. The tour route includes the graveyard of people who died from leprosy, the Lime Quarry, Robert Sobukwe’s house, the Bluestone quarry, the army and navy bunkers and the Maximum Security Prison where thousands of South Africa’s freedom fighters were incarcerated for years. The tour culminates with a viewing of Nelson Mandela’s cell. Return to your hotel where you can freshen-up and change into concert dress for this evenings concert hosted by a local school or university. Dinner at your hotel and overnight. Day 3. Cape Peninsula – 2nd concert. Depart by coach via the popular and most scenic Chapman’s Peak Drive to cape Point at the Cape of Good Hope. 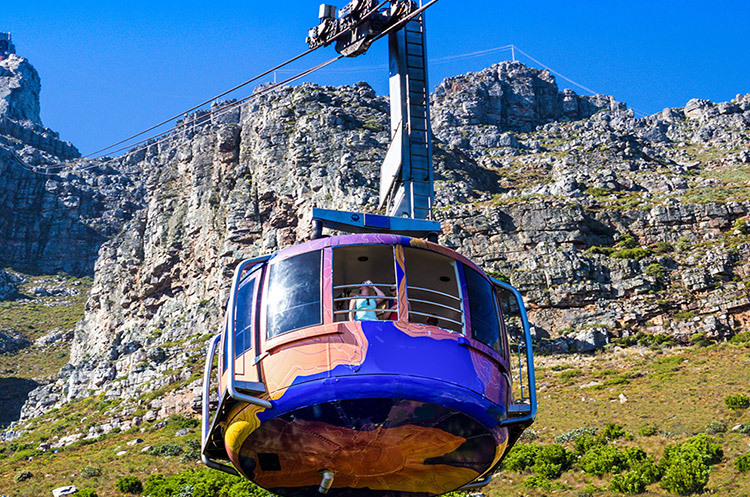 Our Cape Peninsula tour begins with a scenic drive along the Atlantic coast, passing through the cosmopolitan suburbs of Sea Point and Camps Bay to Hout Bay. From there we travel to the Cape Point, a breathtaking rocky promontory. The Cape Point tour returns to Cape Town by way of Simon’s Town where you will visit Boulders beach, famous for its African Penguin Colony. Enjoy a seafood lunch at a restaurant in the harbor before you travel to the trendy Camps Bay for a beautiful sunset at the sea. Evening joint concert with a local choir. Day 4. Cape Town – Hermanus. Check out and depart by coach for 120 km’s southeast along the coast to Hermanus. It’s known as a whale-watching destination. Beaches include Voëlklip Beach and the broad Grotto Beach, overlooking Walker Bay. The Old Harbour Museum is a site encompassing the old harbour, a fishermen’s village and the Whale House Museum. The latter has informative displays and a suspended skeleton of a whale. Afternoon at leisure to explore and enjoy whale watching. Dinner is at your hotel and overnight. Day 5. Hermanus – Mossel Bay – 3rd concert. Check out and depart for 300 km’s along the Garden Route to Mossel Bay. Mossel Bay is known for the wide Santos Beach and the 19th-century Cape St. Blaize Lighthouse, which offers bay views. The Bartolomeu Dias Museum Complex includes the Maritime Museum, the Shell Museum and botanical gardens. The Post Office Tree, a milkwood tree in the complex, has been used as a mail collection point since the 1500s. Afternoon concert will be in the Dias Museum Complex, popular with the locals. Dinner at the Sea Gypsea restaurant on the harbor and overnight at The Point. Day 6. Mossel Bay – Botlierskop. Just 25 km’s from your hotel is the Botlierskop Private Game reserve. Morning 3-hour game drive in open safari vehicles with qualified game rangers. Return to Mossel Bay for own lunch and afternoon at leisure around the beaches. Late afternoon relaxed and romantic 1½ – 2-hour cruise around Seal Island and the Bay, the Point, Hartenbos, Seal Island, Diaz Beach, De Bakke and Santo’s beaches. Dinner at your hotel and overnight. Check out and depart by coach for 90 km’s – about 1½ hours to Oudtshoorn. The Cango Caves are located in Precambrian limestones at the foothills of the Swartberg range near the town of Oudtshoorn. “You catch your breath as the first view of VAN ZYL’S HALL opens up before you. Ancient stalactites, aptly known as the dried tobacco leaves of Oudtshoorn, festoon the grey-blue of the limestone ceiling. This spacious hall is over 90 metres long, 50 metres wide at its widest point, and between 14 and 18 metres high. Nearly 100 metres of solid limestone roof separates the cavern from the ridgecrest above.” You will enjoy a 1 hour guided tour. An hour’s drive takes you to George airport, where you will get an afternoon flight to Johannesburg OR Tambo airport. Transfer by luxury air-conditioned coach to Pretoria and check in at your 3* hotel. Dinner at a local restaurant and overnight at the hotel. Day 8. Pretoria – 4th concert. Morning guided sightseeing of Pretoria visiting the historical Voortrekker Monument and the Union Buildings, office of the President of South Africa, with a drive-by the house of Paul Kruger and the main square in the city. Evening joint concert with a local choir, followed by dinner hosted by the SA choir. Day 9. Soweto – 5th concert. Travel by coach for ± 1 hour to Soweto located south of Johannesburg. Soweto obtained its name from the first two letters of South Western Township which was the original description of the area. You will visit the house of Mr. Nelson Mandela and drive past various landmarks. Following lunch your performance at a local venue in Soweto. Afternoon return to Pretoria where you will have dinner and overnight. Check out and depart to the Lion & Safari Park, an hour away from your hotel. Depending on the departure time of your flight, you could have lunch at the carnivore restaurant located close to the Lion Park. Casual, colourful joint offering all-you-can-eat meats cooked on an open fire and served on swords. Transfer by coach to Johannesburg OR Tambo airport for your departure flight.